chakras or just allowing the flow of the meditation. 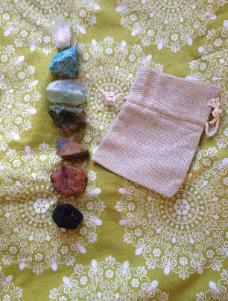 may even choose to pick to do one stone for a certain chakra during your healing time. healing to be with you. light sea salt cleans and the use of pure intent. and I will Reiki charge and dedicate them for that use. Each stone is approx. 1" in – 2” size. note/message on which you would like at time of purchase. Selenite assists in clearing your energy / aura. Used for clearing the aura field when doing healing work on an individual. will see them dry and wet to bring out the colors. complement and enhance it. It is not to be used as a prescription, diagnosis or treatment. Healing is not an independent therapy, but one that is part of a holistic healing approach. assume responsibility for your use or misuse of this information.